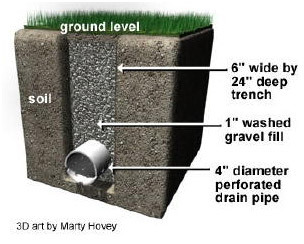 A filter drain is a trench lined with a geotextile and filled with gravel into which runoff water is led, either directly from the drained surface or via a pipe system. The gravel in the filter drain provides some filtering of the runoff, trapping sediment, organic matter and oil residues that can be broken down by bacterial action through time. The runoff rate is reduced, and runoff storage is also provided. Stored water can also pass through the geotextile membrane and some filter drains need not lead to a watercourse at all. Filter drain systems have been widely used by the highway authorities for roads drainage and feature in the Design Manual for Roads and Bridges (8). Hybrid infiltration systems and filter drains have been used for a variety of developments, including both residential and industrial sites. View sites in Wales with a Filter/French drain system.